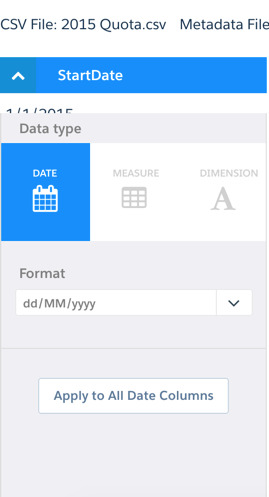 Date component is a powerful feature in Salesforce Wave. Let’s walk through how Dates are used from loading the dataset, filtering and displaying in Dashboards. Important consideration while loading the dataset is the date format. Make sure we have the correct data format set before loading the data. In the Metadata JSON, we can set default values. “fiscalMonthOffset” : 0, // This field needs to be set for fiscal year calculations. Compact filters come handy to setup relative filtering. e.g Current Month. Same code can be modified to support Month to Date or Year to Date. Most of the time, we need to apply compact filters for certain steps and SAQL filter for few. It’s a good practice to set up selection binding to include both compact and SAQL filters. In the next blog we will discuss about fiscal date, date groups and other filter options.